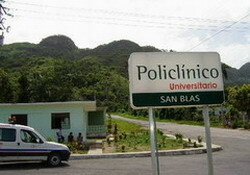 The Alcides Pino policlinic located in the homonymous neighbourhood in Holguin city will join the national program of the comprehensive investigation of the Cuban family. The clinic staffers are ready to undertake such mass research, said Dr. Dania Tamayo, the head of the institution. In a meeting presided over by Marcia Cobas, Public Health deputy minister, was agreed that the Clinic’s qualified personnel will carry out the investigation in the about 47.000 people living in the community of Alcides Pino. Such research was previously done in the western provinces of Matanzas (Colon municipality) and Pinar del Rio (San Cristobal municipality) whose aim is fighting against the high incidence in the mortality of the non transmissible illnesses. Some 17 units were selected among the 270 country’s policlinics already remodelled to undertake this work, which is at the moment being done by the doctors and nurses of the family. The country is deeply interested in reducing the impact of those illnesses, either by dropping the yet high rates or at least putting death off by way of improving the population’s quality of life, among the things to fight against are smoking, alcoholism and obesity. The most common illnesses striking the Cuban population linked with socially wrong habits are five types of cancer, heart diseases, and the cerebrovascular ones along with diabetes mellitus.